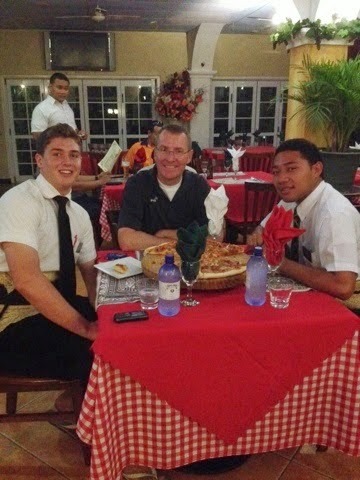 A little USA in Tonga! This week was really good! We did a lot of work! The baptism was a no go, she moved back to her home village! We got a new investigator I'm really excited about and hope to get him going! We went to a members house to invite them to church! It's the Relief Society Pres. and the 2nd Counselor! We went there and invited them! (They haven't been to church for 2 of our transfers here...) We went over and they made us stand out in the rain! We decided to invite them from outside and they got a little angry and the mom said some things that were really mean and really hurt our feelings! I've never felt so bad in my life! I don't think anyone has ever spoken to me like that before! It hurt deep! But I remember that Jesus' people spoke to him like that all the time! He took a lot of nasty things and eventually gave His life! So I can take it! It just isn't very fun when even our members treat us so badly! How do we expect to get into non member homes if our members don't accept us! Other than that the week was great! I'm sorry I couldn't get on yesterday! But here's just a quick update! I I don't really need anything else besides my friendship tie... I'm sad about that! It meant a lot to me! I got 2 of the razor things, my ties and socks were goners! I actually saw the yellow one on an Elder Today! The socks I'm upset about and Sick about the other tie! I got everything else! I got the 3 little books and my hymn book! eating a large meat lovers pizza!!! Hey Family, What's up!!! Happy Father's Day! Give dad a huge hug for me! A big TONGAN hug! I loved your email's, you guys are awesome. This week was really good, we had over 30 Po Malangas! Those are just random lessons taught to anyone. We do have a baptismal commitment for Saturday from Mele! It was a great week. I feel lazy today so no long letter just going to play my Ukulele. I just wanna say I love you and I will email you next week. I loved the picture books and all the fun things, Thank you so much! Tanner! The truck looks unreal! Send pictures of it in the dark. Thank Heavens... My first cold drink in a year! BAM... That's how it's done!! Fefe hake? Man this week was really good! On Tuesday we got our standard of excellence which are the numbers we need to strive for each week! Man they are really high especially for those in small ares but hey guess what!?? The Lord is with us and we will do our best to reach the goals! They are all 15-20 per week. Except the baptisms are 2-5! They are very tough numbers but we need to remember that this is not mans work. This is the work of a Supreme being and with His guidance we will be able to Hasten the work and bring MANY souls unto Christ. So we have been struggling with these numbers... All of Vava'u has been... Last month both zones on Vava'u only had 2 baptisms each... That's 4 baptisms... That is awful... Our goals is each zone to get 40 baptisms a month. So you could say we need to step it up! And we have! Elder Caudill and I are planting seeds! It may not be useful now but We are planting and nourishing! We share 1-3 minute lessons to almost everyone we see! We also try and serve and talk to everyone we see! I can see others opening up to us as we do this! A member that hasn't been that open and friendly with us has actually just become one of our closest friends! She went and bought us eggs and cheese and onions so we can make omelets today! Off topic! Sorry! Back on! This week we did teach 2 of the 3 girls! We committed one to baptism and she said yes! She lives in Mataika which is the zones area! So I talked to them and hopefully we can get her a date to be baptized there! The other girl is also from Mataika but is already a member just inactive! So we committed her to go to church and read the Book of Mormon! They are doing well! The other girl went back to Holonga so I don't know about her... We just received 5 referrals from our branch presidents wife! So we plan on going to them Today or Tomorrow! She told us they want to be baptized but they want to wait until the grandparents pass away... Family is huge here and church can ruin families! I have seen HUGE sacrifices by young 18 year olds and have seen them kicked out! Their Faith is amazing! Anyways, as I heard this I thought of Matthew 10:37 which says that we must love our God more than our Parents and Children! If we love Him more we will follow him and be obedient to him! That's a scripture all of Tonga needs to know and understand! The work is good and moving forward! I am so blessed to serve in such a Beautiful place with Beautiful people and a Beautiful Language! God really does know these people! He really looks after them! Each and every one of them I believe wants to do what is right! It's just hard for them to do so with all the pressure. They are too caught up on "The Kingdom of Tonga" Rather than The Kingdom of God! Yeah on Earth you can be popular and can be high up there and have people look up at you like a star, but what about in the life to come? What about after mortal life? Will they still be popular? Will they still be looked upon as the stars of the sky? No! But those who do what is right in this life will continue on to the next life and be given Glory. We will be as God and what else can you want? You can't want anything more! There is so much more than this life! It's gonna be a good week! I love you all so much! Keep on studying and living this gospel! It's all that really matters :) Smile! Went fishing today~ caught an EEL! So Saturday we had a full day of Ngaue ofa! Service! It was really fun! We built a fence! It was a good time in the pouring rain! We were all muddy from head to toes and soaking wet! But It was an awesome time getting closer with the members through hard labor and taking a shower with the mud! HA ha! Today after netting we are going to the Tahi (Ocean) with two rascals named Tevita and Loma! I love these kids! So I'll have an adventure to tell about next week! The work is good! I love it! I love and miss you! Keep reading the B.O.M! I just finished it again and started yesterday! So get going!